It's a chance to avoid the crush of Black Friday sales shopping - without the usual mad rush! Even so, it will take the fervor of a patriot and the tactical planning of a 4-star general to successfully navigate the first big sales day of the holiday season. This year, Veterans Day is on Monday, November 11. 2019 The result is a three-day weekend full of bargain shopping at malls and department stores nationwide. Every year, Christmas sales start earlier and earlier as the starting bell is rung on Veterans Day. Heading into the 2019 holiday season, watch for the first "Super Saturday" sale of the year falling on (you guessed it) Veterans Day weekend. If you haven't already, first check local newspapers or hunt online for store circulars advertising when, and where, the best Veterans Day sales are taking place. Have your holiday gift list ready, and plan out the appropriate stores to hit along your shopping route. On arrival at the stores, look for Veteran's Day sales on toys, kids clothing, and gifts sets of gloves, scarves, hats and other winter gear at the mega-department stores such as Walmart, Sears, Macy's, and Target. Also watch for retailers such as Best Buy and PC Richard to start pushing early holiday electronics sales with great buys on everything from laptops to flat screen TVs. Looking for a new or used car this time of year? Auto dealers also have a deal for you as they begin to drive their current inventory off the lot to make room for next year's models. Finally, if you're an active duty military, veteran, or an immediate family member, take advantage of free meals offered by a dozen or so nationwide restaurants chains (Applebee's, Olive Garden, and T.G.I. Fridays, to name only a few) in honor of the holiday. Lowe's and Home Depot also traditionally offer 10% discounts to anyone with a valid military ID on Veteran's Day. Don't forget to comparison shop at online stores which offer discounts and early Black Friday bargains on everything from infant and baby clothes to women's fashion clothing. As always, also keep a watchful eye on free shipping offers and discount codes and coupons for even greater savings online. In the end, no worries if you haven't completed all of your holiday shopping by the end of Veteran's Day sales. Remember that Black Friday is less than 3 weeks away! 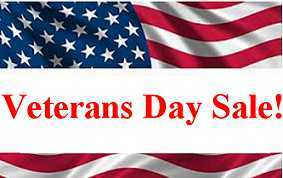 Veteran's Day Sales and Coupon Codes - The latest reports on department store sales and restaurant specials for veterans on offer throughout the holiday weekend. Veteran's Day Car Sales - Check out who's providing the best deals with a searchable database of major car manufacturer's Veteran's Day sales by make, model or location, along with a guide to active duty auto loans for military service members. Veteran's Day Discounts and Free Meals - Information on the latest and greatest bargains at department stores plus free or discounted meals on offer for veterans from nationwide restaurants.